You may or may not remember the contest I hosted not too long ago for Christmas cards from tiny*prints. AND, if you received my Christmas card, you'll remember what a great job tiny*prints did. I was SO, SO pleased with the quality of our cards and I was thrilled to send them to family and friends. So. I'm ecstatic to tell you I'm able to offer yet another chance to win with tiny*prints. Tiny*prints makes gorgeous photo cards, adorable kids cards, and delicious valentine's party invitations. And here's the photo card I l-o-v-e.
Want to win? I thought so. Choose different favorites and enter as many times as you want. Please leave separate comments for each entry. This giveaway will run until January 30th at 8:oopm ET and is open to everyone, world wide. I'll post the winner as soon as they're verified through tiny*prints. Click here to return to the giveaway carnival! I love Tiny*Prints. I used them for Charlie's birth announcement. They have such adorable card designs! I'm smitten for the Cute Chirp card ... okay and the Love Charms. It's so hard to pick just one! And yes, I saved both of those cards as favorites lol! Do the stickers count because I love rainbow hearts, they remind me of when I was a little girl! and cute chirp. I think it's the flowers/birds that I love about their selection. Great feature! Very cute cards! I am so bad about getting cards/pics out in the mail. I do great if online. I love "Swirly Heart", "Sweetheart Smiles", and "Love Garden". Tiny Prints has the cutest stuff! ah...so hard to choose. love the vintage fun. valentine elegance is also on my list! heart grid is nice too! I chose the "Technically Smitten" Valentine's kids card because I think my son Aiden would LOVE it! It is also available on recycled paper! I love vintage fun. It's got such a cool modern look. Love Chicks is great two. I have twins, so I like that there are two birds. Heart Sprinkle is cute, too. I like that it looks like snow. I love the heart sprinkle. reminds me of valentines i had when i was a kid. love blooming reminds me of spring and i love warm weather! love garden is cute too! would love to win, for birth announcements for my best friend who is having a girl soon! I really like the Vintage fun. Monkey's picture would look really sweet on it! Thanks for the chance! The love lines are great. I like the color combo. Pink and brown and so cute together. Thanks for the chance! 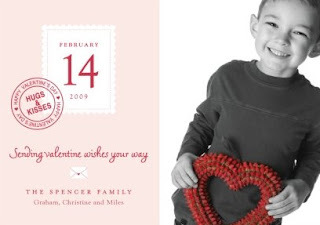 I had never thought to send valentines cards with Monkey's picture, but it does sound like a fun idea. The hanging charm is so sweet and simple it would be good to send to grandparents! I *heart* Tiny Prints!! The Memory Lane card is beautiful! I love the hearts on the scallops! Valentine Elegance is classy and I love how the photo really stands out! The 'Heart Chain' card is really pretty with Chocolate and Pink! My fav color combos! The 'Heart Sprinkle' card is so pretty with all the red and faded pink! Love all those hearts! I'm a fan of Dots which 'Valentine's Dots' card has! I love it! I would love to have the "Vintage Fun", it looks like you could have a lot of fun creating those. LOVE "The Scoop" so cute! i love hte scoop! I'm having so much fun making friends and blog-hopping again this year. I love the Cute Chirp card - birds are the best! I also faved the Cupcake card - I love cupcakes! So tasty. And I faved The Scoop card - I'm pregnant and craving ice cream these days. I really like "Chirp, Chirp"! I like postage too! I like it because there is room for a nice sized photo and it's so simple. I am crazy about thank you cards. I love the It's My Party Blue Photo Thank You cards for my son. Nice and simple! I also liked the monogram stamp:pink cards for me too. I need to send thank you's out as well. I liked the Address labels. There were so many great ones but i like the Cross border:boy ones. They are simple and I like elegant and simple. I also like the Turtle Chocolate Pond Address labels. I think my little boy would like the tiny turtle. But they are still pretty enough to not be to kid-ish. Roux5582ATyahooDOTcom was the email I used. I like the Orchid Blossoms stationary cards for my little notes to friends. I like the red color they used. It is just pretty! I like the card that says Picked just for you! I love the Reptile Rapture cards. My sons are really into dinosaurs right now, and they’d love to hand these out at school. I registered on the site and saved the card in my favorites. Thanks for the great giveaway. I chose the technically smitten card. I love the Ardent Argyle. I also love the Precious Postage. And, the Valentine Elegance. Great giveaway. I'm a big fan of Tiny Prints. I chose Cute Chirp. I like the colors and that it can come on recycled cardstock. Also love Vintage Fun - SO CUTE! I dig the Passionate Pair card too - sweet card! My favorite is the Love Charms. It's just so cute and unique. loved this vibrant valentine photo card! My favorite is the Ahoy Valentine design because my kids are in the skeletons and skulls phase. I love the Enchanted Princess! It's perfect for my little princess! I like the Photo Band flat card. It would be great for sending little notes or thank you's. I'm getting married this summer. So now I am looking at the wedding announcements, don't know how I didn't notice them before. I really like the Monogrammed Striped Wedding announcement. I like the solid vintage announcements in black probably. Very elegant! Ok, so I love the Modern Initials Announcements. I love the way they have have lower cased initials. That is sort of our thing n+r ..... perfect! I like the butterfly lace announcements. The lace looks elegant but not over the top. I like that it comes in orange. I love the Vintage Fun photo card. I've always loved the brown and pink combination and this one is so sweet! I also picked The Scoop, both my girls love ice cream! I love the Floral Flurry Announcements and Save the Date cards. They come in orange and pink which is the perfect combo for my beau and I.
I like the Sweet Home moving cards. I'll be relocating come wedding day, so these would be perfect! Dandelion Breeze is a cute one. I love the simplicity! OH! I love the Modern Art cards. SO lively, so colorful, so perfect!! The Giraffe Print cards are fun. I can see using those with friends. I love the pink color with the giraffe print! I like the different patterns and prints on the Sweet Sixteen card! Very fun! The Reptile Rapture Valentines cards would be darling for my little guy to send out. He's into the dinos. Precious Postage is TOO CUTE!!! OMG! I love it!! Sweetheart Smiles is another cute one. Love its simplicity! The Beloved Bear tins are darling. Would make such cute Valentine's gifts. I like the Festive florals notecards. I love the color combination! I love the Enchanted Princess design. It reminds me of my 4 yr. old daughter. This is her first Valentine at school and these would be adorable to give out. Thank you! I love the Ahoy, Valentine cards!! The card are beautiful.My favorite is Monkey Love,too cute. matternu@aol.com the name my account is under. I like the dotted dance in the color stream address labels. They are very pretty and elegant. I like the Stylish Snapshot address labels. I can think of several cute photos for that. I like the Cute Giraffe address labels. Nice and elegant. I've used TP several times and have never dissapointed. I love the Heart Sprinkle card for this Valentines day, its so sweet! I have Heart Chains saved as a fav.